Believing that life always gives us all a second chance is too bookish a thought. Because sometimes, by the time we finally realize our faults and true potential, times have changed dramatically. However, life seemed to have different plans as it throws Charlie in Aster's way, who was silently walking through instabilities of her own destiny. He could never have guessed, but he was in for an absolute unthoughtful phase of profoundness, which was going to last forever. Promise me a Million Times is a story of dreams, friendship, struggles and a will to make up for every loss with love by your side. Review- Promise Me A Million Times is brilliant debut by Mr. Keshav Aneel where author serves us not only a romantic fiction but also a kind of story which makes readers feel the characters. Kudos to the author for this brilliant debut. I loved the bond shared by Charlie and Aster. Author has amazing skill to describe all sort of emotions in few words. Also this story not only entertain you but also teaches few important life lesson. 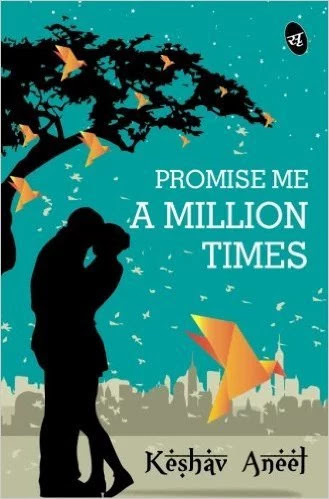 Overall Promise Me A Million Times is one of the few romantic fictions by an Indian author which touches your heart. A Must Read book for all the romance lovers.